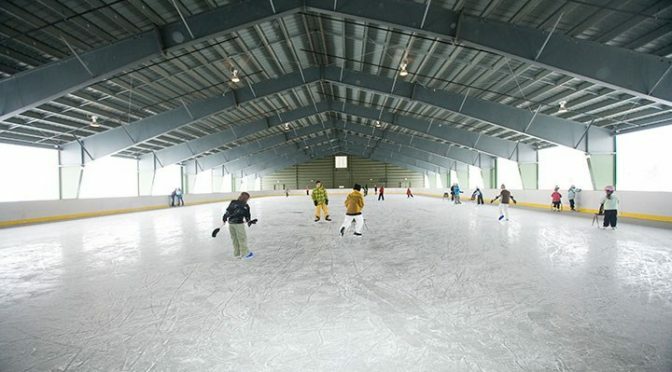 Ludlow, VT – Okemo’s Ice House ice skating pavilion at Jackson Gore will be opening earlier than ever this winter and offering a more consistent ice skating surface thanks to a new, technologically advanced refrigeration system that can make ice at temperatures well above freezing. The new IceMat system at Okemo, similar to systems already in place at Rockefeller Center and the Pond at Bryant Park, will create uniform ice temperatures in varied weather conditions, allowing the Vermont ski and snowboard resort to offer ice skating to its winter guests early in the season and throughout the entire winter. “Installing an IceMat system will provide our guests with better quality ice and an overall better ice skating experience in Okemo’s Ice House,” said Okemo Vice President and General Manager Bruce Schmidt. Manufactured by Calmac, IceMat ice rink systems are prefabricated ice rink floors made of sturdy polyethylene tubing that can be custom designed to the rink’s specifications and installed in just a few days and disassembled for storage just as quickly. IceMat ice rinks unroll much like a carpet and connect to a refrigeration unit. A coolant is circulated through the tubes to begin the cooling process and the rink’s unique piping system provides a counterflow that circulates coolant in opposite directions, to even out surface temperatures. As the mats cool, water is sprayed on the rink in mist form. Within hours, ice completely covers the mats to form a perfectly uniform ice sheet. Installation of the IceMat is scheduled for early November and Okemo plans to offer ice skating to guests starting Thanksgiving weekend.